If you have a tooth with severe damage caused by trauma or decay, you may need to have a crown put into place in order to allow it to function properly and look like new. 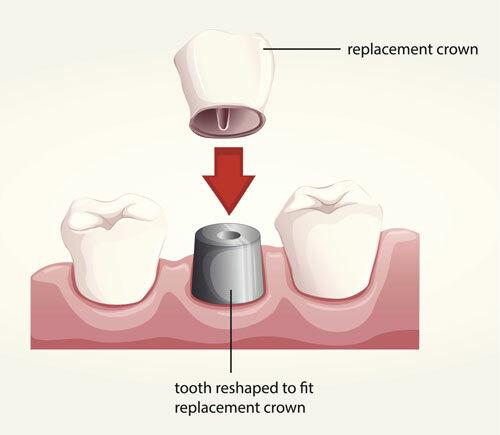 Crowns are durable coverings that have been custom-created to fit over the tooth beginning at the gum line. Traditionally, the creation of a crown is usually done in a dental lab, but a new alternative has been created: same-day crowns. Same-day crowns are created using advanced CAD/CAM technology, and it allows your periodontist to create laboratory-grade crowns in a matter of minutes. This is a great advantage when you consider that in the past, being fitted for a crown can take up to three visits to complete. Additionally, same-day crowns using this technology are just as successful as traditional crowns created in a lab. The process of developing your crown will start on the same day of your appointment. Your tooth will be prepared by removing any present decay and shaping the tooth using a dental drill so that the crown can fit over the top of it. Next, a small scanning wand connected to a computer will be used to take digital images of the inside of your mouth in order to create a precise 3D model of your teeth. The CAD / CAM software will then be used to create the perfect crown for your tooth. Once your same-day crown has been put into place, you'll need to take care of it in the same way that you would care for your other, natural teeth. Brushing and flossing is essential, even for your crown, and it is more important than ever to follow up with your dentist regularly. If you grind your teeth, you'll also want to invest in a mouth guard to protect both your restored and natural teeth. Please contact us if you have any questions about about same day crowns.